One of the things that I love most about Bible journaling is that it truly gives me the chance to show how I apply certain Bible verses to my life. Yes, some of my entries are more vague- just made to look pretty more than any interpretation of any kind... but others depict what I'm feeling as I'm journaling. Like the pages I've done for my son. Today, in honor of Autism Awareness Month, I wanted to share a few of those pages with all of you. When your child receives a diagnosis of autism, there is a lot of uncertainty that can come along with that. Will my child ever speak? Will he communicate? Will he be able to live on his own? Will he marry and have a family of his own? 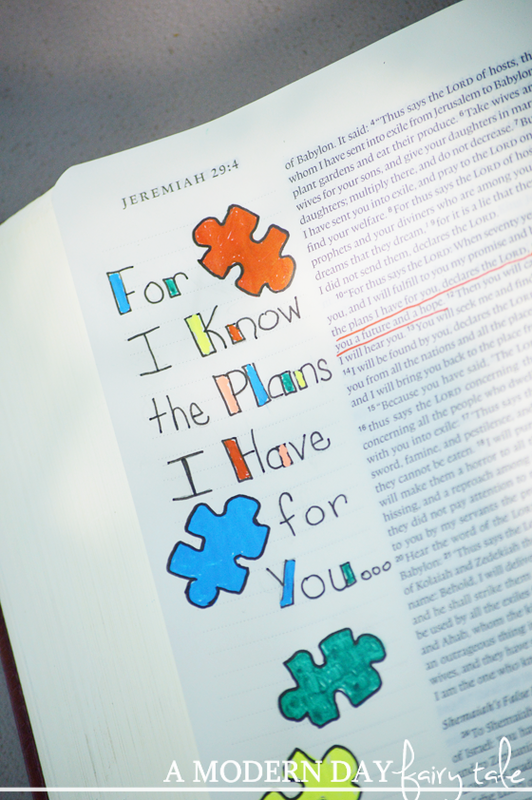 There are no guarantees... but this verse serves as a reminder that God has plans for us and for our children that our greater than any of those that we may have had. This was one of the very first pages I did in my Bible and one that I come back to often! It may be very simple, but it's a verse that meant a lot to me in regards to my son, and that simplicity was all that I needed! This may be one of my absolute pages I've done in my journaling Bible yet... because it means so much to me in many ways. This page is ALL my son. First up, it's science! My son loves science, so the idea of gold (AU) for autism acceptance (as an alternative to blue which is the color of Autism Speaks- an organization that we as an autism family do NOT support) was just so fitting, and I wanted to incorporate that into this page. So, I created this page referencing the periodic table of elements in a fun way, as a reminder that God is awesome, and that again, this is all just part of his plan and how he created my son to be. 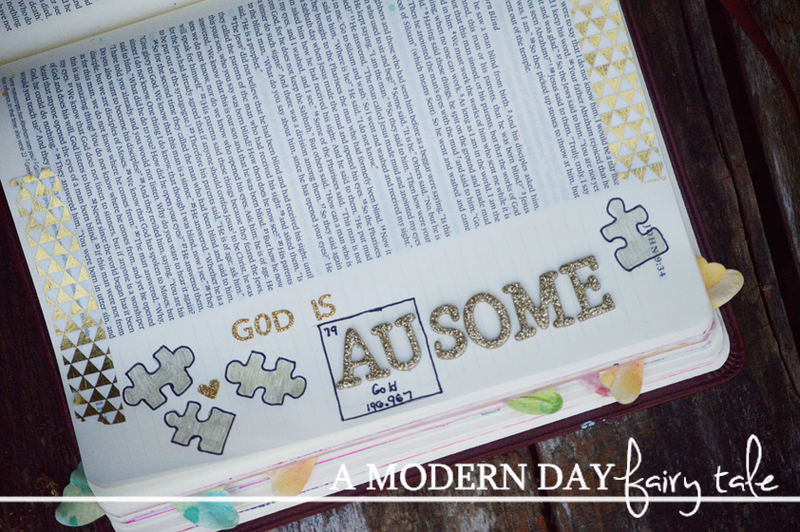 I added in some gold puzzle pieces to bring the autism in even more and just used lots and lots of gold (one of my favorite colors to journal with anyway). It perfectly captured my son and my views on this particular verse. I love it! These are just a few pages that I've done personally, but here are a few more verses that you may find useful, both for autism and other special needs.